What is the unit good for? Kayak fishing is incredibly interesting – this is something that is definitively shown as the trend continues to be particularly hot. It combines the pleasure of fishing with the excitement of being in the water, hands-on the action. However, in order to experience this, you’d have to purchase a kayak. And this is where the excitement disappears. This is a challenging undertaking – one which is going to require quite a lot of aforethought and consideration. If you have no experience at all, it is quickly going to become an unpleasant ordeal – one that’s rather overwhelming. This is the main reason for which we decided to provide you with a quick overview of a recreational kayak which is perfect for you and your fishing mate. 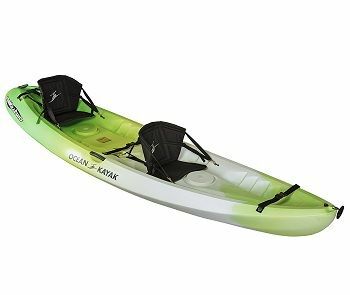 The Ocean Kayak 12-Feet Malibu Two Tandem Sit-On-Top Recreational Kayak is a great option and it is going to provide you with quite a few perks. To be completely honest, the kayak is great for what it is intended for – two-men fishing trips. The construction, design, length, width, propulsion and other important characteristics all lead towards it being a true recreational kayak which is designated for regular fishing trips. This means that it is not wise to expect some serious performance capabilities from it. This is not to say that the unit is not durable or reliable – right on the contrast, it is perfectly extruded and incredibly reliable but it’s not intended for the challenges of the quick current or the big waves in the ocean. Therefore, the ideal setting for the kayak is still water. This covers anything from lakes and ponds to near-shore water and slow-moving rivers. All in all, you can fish with it almost everywhere you go. 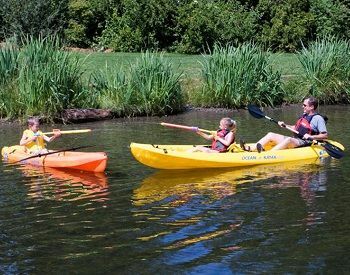 The kayak is also good for recreational tours as it can fit two people and a kit on the front – it’s pretty much the perfect unit for a young family with a small child. Obviously, it is a formidable choice, so let’s go right ahead and have a look at the characteristics which should be accounted for. As you may suppose, this is a hardened kayak with an extruded construction and a single-piece hull design. This is usually the overly preferred setting. Now, the unit is roto-molded from high-quality polyethylene, which is something rather beneficial. It attests to the overall quality of the kayak. The design of the kayak is fairly straightforward and there really isn’t something that stands out definitively. The only thing which is particularly interesting is the overlapping foot wells. They are specifically designed to keep the kayak compact while at the same time providing you with the necessary comfort and convenience. This is definitely something that you should consider. The seats are also built-in. They are ergonomic and quite comfortable. They attribute to the overall appeal as well as sensation that comes with this unit. If there is one thing about recreational, 12-feet hardened kayaks is that they are easily propelled. This is a tandem unit, which makes it even easier for each individual. The kayak doesn’t come with pedals or a section for motor and it is propelled with paddles and your own two hands. Rest assured, however, that this is not a challenge. You will quickly see how easy it is to paddle in this unit. The sit-on-top design is also something which is going to attribute to this quite conveniently. With this in mind, you can expect to use it with another member easy without any serious effort, even if you decide to put your kid in front of it. When it comes to it, the kayak is particularly convenient. Even though it is designated for two people, it is actually quite compact. It is a true recreational unit at 12 feet of length. This is far more important than you might think. The length is going to determine a few different things. First of all, the kayak is fairly quick. You can get serious speed without a lot of hassle, thanks to the comparatively longer length. This is also something which is going to make sure that the unit performs well on still water and it glides very smoothly on the surface. It has serious tracking capabilities. Additionally, the width is quite average. It is 34 inches wide which gives it all the initial stability that you need. This is going to make it easy for you to onboard it and to ensure that everything is handled properly. This is especially important if you are a beginner and you want to get you and your family into kayaking. The unit is fairly easy to maneuver despite the longer length. It is also quite lightweight but it has serious weight handling capacity of up to 425 pounds, which is more than enough for your equipment. The unit comes with a few different features and advantages. There are bow and stern carry handles to ensure easy loading on the top of your car. The foot wells, as we mentioned, are created with the usage of a patented overlapping design which is going to ensure that the compactness of the kayak is kept while providing comfortable tandem paddling capabilities. All in all, this is a quite convenient unit which is reliable and also rather affordable. It is capable of being a great fishing kayak for you and your mate. At the same time, it provides perfect paddling capabilities for your family as you can easily take your wife and kid with you on a casual day trip. The kayak requires holders to be installed on the top of your vehicle in order for you to transport it. However, the design is convenient and the hull is made in a way to stack within other kayaks of this kind, ensuring easy dock storage capabilities. This is definitely something fairly convenient that you might want to take into account.